Grip Wrench is the one tool that does it all. It grips without damaging surfaces and gets into tight areas where other wrenches won’t fit. Use it anywhere. The Grip Wrench is the right tool for every job. Loosen virtually anything in one easy motion! If you’ve ever busted a nail or a knuckle, then the Grip Wrench is for you. The Grip Wrench’s unique gripping and locking action, combined with the power of the handle lets you easily open, loosen, or tighten in one easy motion. It’s the perfect tool for the kitchen, around the shop, or under the hood. 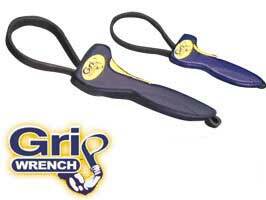 The Grip Wrench fits any size or shape! The durable rubber strap and the heavy-duty polycarbonate handle allows you to easily grip any size or shape. It even can loosen the lids on stubborn jars.